Do you love British heritage? A TV documentary series that explores this nation’s greatest secrets. The Kickstarter project had launched. The aim is to raise money for a new episode, which shall be broadcast on the Community Channel TV station and on Youtube. 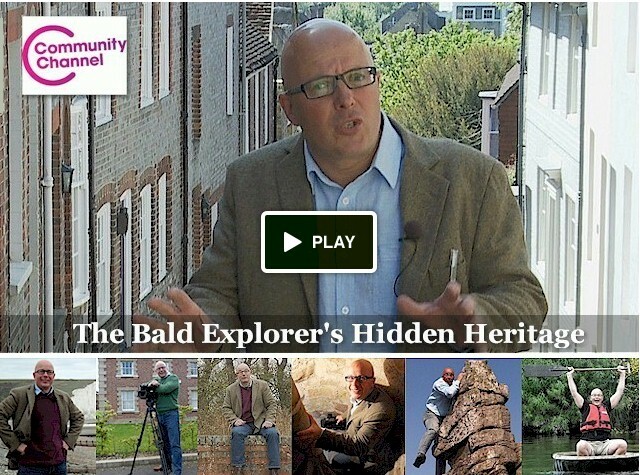 I am Richard Vobes, the Bald Explorer, and for the past three years I have been self-funding a series of films exploring Britain’s wonderful heritage. Community Channel, a not-for-profit digital TV station, has been broadcasting these programmes on their network which have now been enjoyed by thousands of viewers. Following this success, it seems I now have an audience who would like some more. However, being a charity funded organisation Community Channel cannot commission me, and I do not have the funds to make these programmes myself anymore. Rather than trying to fund the whole series in one go, we just want to raise enough money to make the first episode. If successful, it will be broadcast in the New Year on Community Channel and repeated many times thereafter – and your name could be on the credits! And, of course, all of our Kickstarter producers will have advanced downloads of the episode the minute it pops out of the edit room! The reason we have chosen Bridgnorth is simple; it is one of Britain’s gems. Tucked away in the Midlands, it is found next to Ironbridge; birthplace of the Industrial Revolution. It lies on the River Severn, above Worchester and below Shrewsbury, and is at one end of the Severn Valley Railway – which still offers a fantastic heritage steam service. There is more to it than that, of course. It has a unique funicular; a Victorian Cliff Railway, the steepest in Britain; a church designed by the great civil engineer Thomas Telford; a castle keep, which is currently tilting at a greater angle than the leaning tower of Pisa; cave dwellings, once the home of the poor; a hermitage; and was also the scene of dramatic skirmishes during the English Civil War.